It’s everyone’s favorite wizard, Harry Potter. He may not have been the first one to pull off the ‘scarface’ look but he sure as hell made a lot of money doing it. 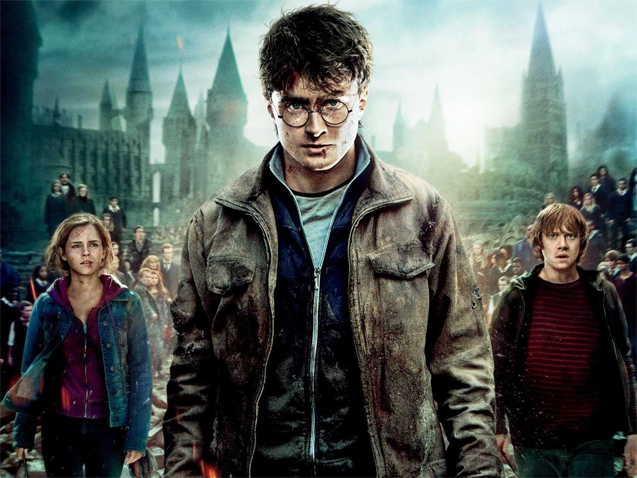 Daniel Radcliffe brought J.K. Rowling’s story to life as the boy who lived but to make those massive and magical films required no shortage of hard work and ingenuity. This behind the scenes look at some of the more intricate parts of bringing the magic to life looks at some facts about the Harry Potter franchise that are so astonishing they could in fact be the product of magic. The set designers for Diagon Alley spent countless hours assembling every window display just so. The set was so detailed that there were over 20,000 props displayed in the various shop fronts in a massive set build. Crew members and set builders used powerful ropes and pully systems to wrench and pull the storefront portions of the set to give the entire alley a whimsical and slightly off-kilter look. Once inside Hogwarts, there was only one staircase set built. For the M.C. Escher-esqe staircase effect that set was multiplied and manipulated digitally. Robbie Coltrane, the actor who played Rubeus Hagrid, had to wear a six piece hair kit to simulate Hagrid’s bushy beard. The beard in question seemed to have a life of its own; things always seemed to be getting stuck in it. In one instance a live bat (intended to be a prop) became entangled in the complicated hair kit! In order to ‘sell’ the idea that Hagrid was a giant, two sets were built for Hagrid’s Hut. One was sized so that Coltrane would appear large next to the contents of his home and the other was size much larger so that others would appear small by comparison. Add that to the complicated hair and makeup and Hagrid just might be the most labor intensive character in the movies. The case of Hagrid’s duel huts is small potatoes compared to the grand total of 588 sets that were built for the eight movies. Potions are commonplace in the movies. Every instance where an actor drinks a magical potion they are actually just taking a sip of some lukewarm soup. Speaking of potions, in the potions classroom there are over 1,000 prop bottles that line the walls. And to top it off, the majority of the dusty volumes that line the walls of Dumbledore’s office are phonebooks that have been rebound then ‘dusted’. For the kitten-crazed Professor Umbridge, the crew held a kitten photo shoot which starred over 40 young cats. The photos were then screen printed onto plates to form her wall-mounted collection. Don’t worry, the kittens were all adopted or came from volunteer homes. When filming the full-sized wizard’s chess the crew had to contend with pieces that weighed over 500 pounds each. In the same vein, the Knight’s Bus was so top heavy that it had to have an additional balancing weight of four tons added to the lower portion to stop it from falling over. All of the exterior shots of Hogwarts were made through the use of a highly detailed model. It took 40 people seven months to produce the scale replica of the famous wizarding school. Each and every shingle on the many roofs and spires was laid by hand.The detailed bridge with its latticework of delicate supports took three months alone. To simulate a snowfall the crew used salt in lieu of other options for fake snow. Any accumulation had to be cleared right away however as the salt would disintegrate the delicate model. To give an authentic effect the graphics team hand wrote and sealed thousands of letters and envelopes for the owl post to carry. Then had to double up on their efforts after learning that the first run was too heavy for the birds to carry. A second batch produced on lighter stationery was in order. To further complicate things, it was no easy feat to train the owls to carry the letters either. It took over six months to train the owls to carry letters in their beaks and talons.